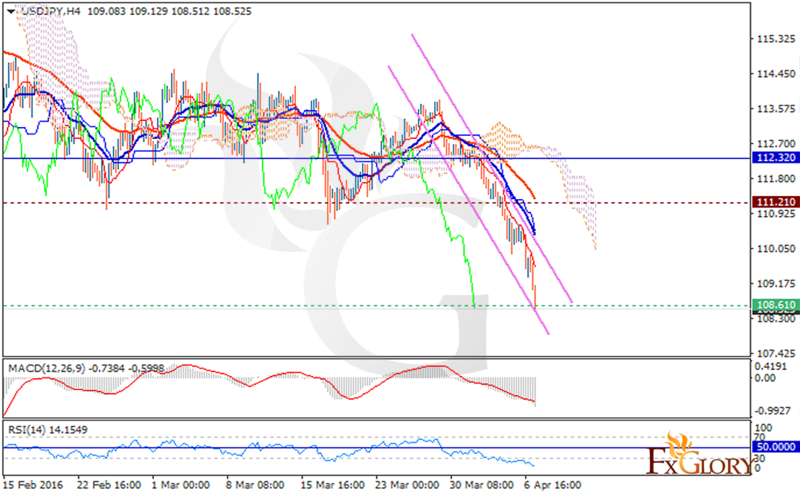 USDJPY for today is chiefly affected by the news factors in US such as Natural Gas, Unemployment Claims and Consumer Credit m/m therefore it would be more volatile. The Support lies at 108.61 with resistance at 111.21 both located below the weekly pivot point at 112.32. The EMA of 50 is above the EMA of 20. The price is falling down the descendant channel and further decline is expected. The MACD indicator is in negative territory signaling the price fall and the RSI is below the 50 level. Furthermore, the price is under the Ichimoku Cloud and the Chinkou Span along with Tenkan-sen and Kijun-sen showing downward trends. Short positions are recommended. The price will push the support at 108.20.